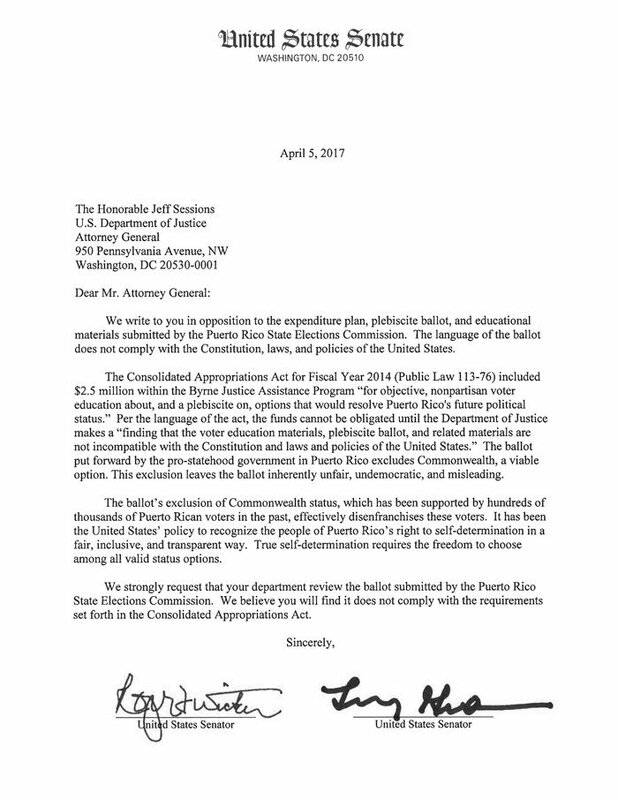 A letter requesting that the U.S. Attorney General withhold certification of the ballot for a federally sponsored political status plebiscite in the territory has been signed by eight members of the U.S. Senate, where the 3.3 million U.S. citizens of Puerto Rico have no democratic representation. The letter was signed by Sen. Roger Wicker (R-MS), Sen. Lindsey Graham (R-SC), Sen. Thom Tillis (R-NC), Sen. Richard Burr (R-NC), Sen. Roy Blunt (R-MO), Sen. Thad Cochran (R-MS), Sen Mike Enzi (R-WY), and Sen. Tom Cotton (R-AR). A brief history of current federal and territorial law and policy confirms that the plebiscite plan satisfies criteria for required certification by the U.S. Attorney General. In 2014 the U.S. Congress recognized its responsibility to address a 2012 locally sponsored political status vote in Puerto Rico. A bipartisan bill authorizing a federally sponsored plebiscite to confirm the legally certified results of the 2012 vote was enacted. That law (P.L. 113-76) prescribes the terms for a status vote recognized by the U.S. as an informed act of democratic self-determination for 3.3 million U.S. citizens in Puerto Rico. In the 2012 referendum a clear and undisputed majority of 54% voted to end the “current territorial status” in an up or down vote. That result stands alone and apart from a second ballot question on non-territorial fully democratic status options. On that separate question 61% voted for statehood, just over 5% for independence, and 33% for independence with a treaty of “free association.” The two-tier ballot format narrowing choices to achieve a majority result was earlier agreed on by President Reagan, a Democratic majority in Congress, the federal courts and the U.N. to resolve the political status of three U.S.-governed Pacific island territories. Deciphering the 2012 Puerto Rico Plebiscite Results. Anti-statehood political factions in Puerto Rico demanded that ballots left blank on the second question be counted as votes against statehood. There is no legal basis for that anti-democratic demand, especially since the number of affirmative votes for statehood on the second question was greater than the number of affirmative votes for the current territorial status on the first ballot question. The only democratic interpretation of the 2012 vote is that continuation of the current territorial status was rejected by a majority in an up or down vote. In enacting the 2014 plebiscite enabling law (P.L. 113-76), Congress prescribed clear criteria for the U.S. Attorney General to certify that locally promulgated ballot options and voter education materials are not contrary to U.S. standards for a free and informed democratic act of self-determination. In doing so Congress had the wisdom also to ensure that certification criteria did not enmesh the federal government in the local government’s internal political process for defining the ballot options. Thus, the federal act simply states that options on the ballot and related voter information must be certified by U.S. Attorney General as “not incompatible with the Constitution and laws and policies of the United States.” That does not go to the question of what options are on the ballot, but instead authorizes the U.S. Attorney General to determine if options approved locally for the ballot are contrary to any federal statute or duly adopted policy. There is no federal mandate that preempts or supersedes the local constitutional process for the territorial government to determine future political status options on the ballot. Rather, the U.S. Attorney General certification provisions limit the scope of the certification criteria to keep the federal government out of the local deliberative political process, until the Puerto Rico government itself produces the definitions that will be on the ballot. This was the correct approach given the results of the 2012 vote, in light of which the local government legally and democratically could have made the plebiscite an up or down vote on statehood. Given the local government’s decision to include independence and free association options under its internal plebiscite law (PR Act No. 7-2017), the U.S. would appear to have no compelling basis to deny certification. Specifically, there does not appear to be any applicable federal law or official policy that requires all possible or proposed options to be presented to voters on the plebiscite ballot. Indeed, in addition to the incompatibility criteria for certification of the ballot the only other relevant provision of the federal plebiscite enabling act is the requirement that the voter education program on ballot content must address future political status options that will “resolve the status of Puerto Rico.” The current status, as confirmed by the Supreme Court of the United States in the 2016 Sanchez Valle case, is not a form of fully democratic self-government. As it exists under the U.S. Constitution and federal law, continuation of the current territorial status with a local “commonwealth” constitution will not resolve the status of Puerto Rico. That is why 1967 and 1993 status votes in which a “commonwealth” option was included on the ballot did not not resolve the status question, and a 1998 vote with a “None of the Above” ballot option also prevented a majority vote for any political status option. Read the changing definition of “Commonwealth” in Puerto Rico’s Early Plebiscites. That confused and inconclusive history of status votes led to the 2012 locally sponsored vote in which majority votes to end territorial status and seek statehood were achieved. P.L. 113-76 confirms federal law and policy enabling the local government to determine what status options the voters should be presented with for the purposes of seeking a fully democratic self-governing future status instead of continuation of the current territorial status. That is consistent not only with the certified 2012 vote results, it also recognizes the legal and political authority of the territorial government under the territorial constitution established by Congress in 1952 to determine the content of local election law. That local internal authority to determine and regulate local election procedures in a manner not incompatible with federal law was affirmed in the 1982 ruling of the U.S. Supreme Court in the case of PDP v. Rodriguez. Accordingly, under P.L. 113-76, the federal enabling act for the status vote scheduled for June 11, it is the act of the territorial government enabling and edging the local legal terms for the plebiscite (PR Act No. 7-2017) that triggers the U.S. Attorney General’s narrowly prescribed certification authority. If certification is denied the PR government could revise the ballot to conform with the U.S. Attorney General’s action, but under P.L. 113-76 and the PDP v. Rodriguez ruling, it is the local government that must act to meet the certification criteria of the federal plebiscite enabling act. In light of the history of status votes in Puerto Rico, the reports of the President’s Task Force on Puerto Rico’s Status since 2005, and the record before Congress in enacting P.L. 113-76, if anything it would be incompatible with the U.S. Constitution, laws and policies of the U.S. for the U.S. Attorney General to deny certification of the ballot based on a finding that the current status should be on the ballot.